Sites or things I run across or am doing to save money or better said, get more for my money. 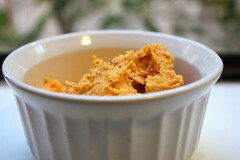 I’ve been inspired to share how I prepare sweet potatoes by this post here from my friend Evelyn over at “Become a Healthier You”. Check out that post because she gives some of the health benefits of sweet potatoes so I won’t go into it here. But I will mention that sweet potatoes are inexpensive, at least they are in my neck of the woods. So cheap and good for you is a always a winner in my book. Now I’ve mentioned it before, that I really don’t like to cook. So whatever I cook has gotta be quick and easy with minimal preparation time. But I also like to do it cheap and healthy because I’ll admit, I still indulge in stuff that really is not good for you. So I incorporate the good healthy foods as much as I can and in order for me to do that, it can’t be too much trouble. I bake the sweet potatoes at 400 degrees F, but of course everybody’s oven is different so find which temp works best for you. It probably does not even matter what temp you use. just be aware the lower the temp, the longer it will take them to cook. While you can bake just one sweet potato, I think it’s a waste of energy to do that. Plus I don’t like to have to cook everyday so I do 4 or more at one time. While your waiting for the oven to heat, wash your sweet potatoes and dry them off. 2) Place them on a cookie sheet, baking pan or whatever shallow pan you have and put ’em in the oven. 3) Bake for approx 45 minutes to 1 hr. Smaller sweet potatoes will of course cook faster than larger ones. You’ll know they are ready when they are soft. Sometimes, you’ll see the flesh on the outside of the potato. The softer they are the sweeter they’ll be too. 4) Take ’em out of the oven and let them cool down a bit. Once they are cool enough for you to handle, unless you have asbestos hands :-), peel the potatoes you are going to eat. You’ll find that the skin comes off very easy. That’s another way to tell if you’ve cooked them long enough. As you get more experience preparing sweet potatoes this way, you’ll be able to judge based on their size, how long you’ll need to bake them. Now some of you may want to stop right there, plop ’em on a plate and start chowing down. But I like mine similar to the traditional sweet potato pie taste so let’s continue. sweetener of choice ie honey, agave etc. Use something like these as we are trying to keep this healthy. Mix it all up with a fork and have at it! Quick, easy, cheap and nutritious…well except for the bake time. Now that’s my kind of dish! Hope y’all enjoy this and let me know in the comments if you try it. Hi everyone! I’m back to continue talking about things I have done to save on my heating bill. 4) Turn down the thermostat even further when you are going to be away from home for more than a few hours and at night/day (if you work nights) when you are sleeping. 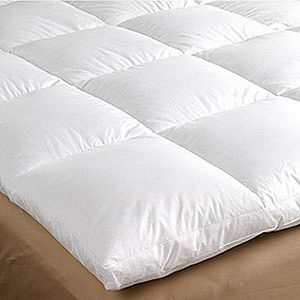 4) Use comforters and blankets on your bed. 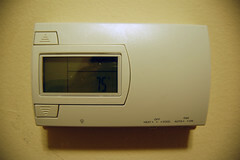 5) Install a programmable thermostat. Do not believe that mess when the utility company says that it costs more to get the house up to the higher temp that you set when you get home than to leave the thermostat set at 68 degrees or whatever 24/7/365. That is a bunch of BS! Remember what I said in the previous post, the more you use, the more you pay. Based on that, you should immediately see why they would tell you to leave your furnace set on a constant temperature all the time. Now I’m not saying shut the unit off…do NOT do that. What I am suggesting is to take it down to about 50 degrees, maybe 55-60 degrees if you are in a very cold climate, to insure that your water pipes in the house don’t freeze which will cause them to burst. Then you’ll really have a problem…and a very expensive one at that. The more you use, the more you pay. The same principle applies to when you are sleeping at the end of your day. That’s why I mentioned using comforters on your bed in addition to blankets. Comforters are pretty much like a sleeping bag, just not closed in. If you’ve ever slept in a sleeping bag outdoors when it’s cool or cold, you’ll be surprised at how warm you are while sleeping. That’s because YOU are the heater inside the bag as a human’s body temperature is around 98.6 degrees. Yeah, it’s pretty cold when you gotta get up and go to the restroom in the middle of the night, but look at it like this. You won’t completely wake yourself up because you will not be messing around. You’ll want to get back IN that warm bed you just got out of as fast as possible. Once you get used to it, it becomes second nature. And you’ll be glad when you get your bill. As far as having to get up to start your day in a cold house, well that’s where a programmable thermostat is very helpful. For the price and the convenience, they are very inexpensive and pretty easy to install yourself. In fact I, (not my husband who was my SO at the time) installed my thermostat 12 almost 13 years ago and it still works great. 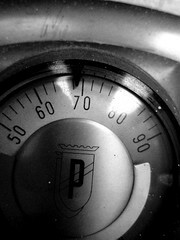 You can set the thermostat to have the furnace come on and go off at certain times of the day. The one I have you can program individual settings for all 7 days of the week. 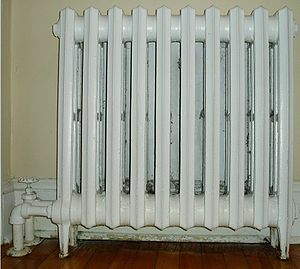 Price-wise, it was the mid range at the time but for the amount of money I have saved on my heating bill and when I was using AC, it has paid for itself many, many times over. Finally, only heat the rooms that you are occupying. Now how in the world do you do that you ask? Well stay tuned as I’ll cover that in the next post. This is a series I wrote back in 2009 when this blog was on Blogspot.com. I think it is as relevant as it was back then, if not more so now given the times we are living in. I’m gonna start off by saying that getting out debt is not easy and not for the faint of heart. It can be compared to eating healthier, dreadlocking your hair or even wearing your hair out in its natural state. Though it may be a bit more accepted now, it’s still a long hard journey that takes loads of patience and thick skin. Why is that you ask? All go against the grain and many times the biggest opponents to your success will be your family and friends. I mention this because how well you can ignore their ignorance while keeping your eye on the prize is crucial to getting where you want to go. In addition to that, it’s a permanent lifestyle change, otherwise you’ll be right back where you started. #1. IMHO, stop believing that stupid saying that’s been going around for decades that there is good debt and bad debt. 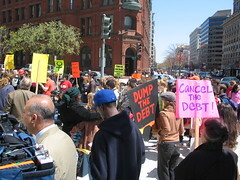 I don’t think “bad debt” needs explanation however “good debt”, is paid off debt. End of story. One of the keys to getting out of debt and staying out is to become conscious of what you are spending your money on starting TODAY!! Yes I’m shouting a bit but I’m trying to make the point that it is extremely important aside from point #1. Examine everything because if you are in credit card debt, more than likely there has been some unconscious spending going on! Many people have absolutely no idea how much they are living on vs what they actually bring home to pay the bills. Also a crystal clear distinction between needs and wants must be made. You may need a purse but you come home with a Coach or (whatever the designer names are) bag. No problem if you are financially OK, but big problem when you’ve got mountains of debt, doing these kinds of things for a long time, zero savings and the boss tells you that you’ll be out of a job in 2 weeks. Can’t quite live in or eat that Coach bag…can you? Here are some everyday examples. Do you really need a cell phone and a land-line phone? Do you really need 25 calling features and voice mail on your land-line phone? I know it sounds like I’m fussing but I think I can do that because that was me at the time. lol Unless you are using every one of the features and making a lot of long distance calls, many times these so-called bundles are not saving you any money. In reality, they’re costing you more. Even if you are using ALL of the features and making a gazillion phone calls, there’s probably a cheaper way. As for voice mail, get an answering machine. That feature alone is approx $7 a month as part of that “package” so in a year you’ve paid $84. Keep the service for 5 years and you’ve paid $420. Now I know you can get an answering machine for way less that $84 and even on the rare chance you had to by a new one every year, you’ll still come out way cheaper and have $50+ dollars to put on that 20% interest credit card debt. Heck for that matter, in the case of long distance, use email more or **gasp** snail mail. It’s the drips like this when looked at individually, don’t look like much but when applied across the board begin to become cracks in the dam in terms of the money being used here and not being available for debt repayment. The only folks getting rich off interest are the bankers. half-gallon of vanilla for $2.50. Looking elsewhere, I found a 5 quart container for $4.00. Now what most people do is look at the price of $4.00 vs $2.50 and immediately choose the half-gallon for $2.50. This can be applied for anything you are consuming on a regular basis. Before I got hip to pricing, I purchased more ice cream next week getting another half-gallon for $2.50. OK, so after 2 purchases, I’ve spent $5.00 for one gallon of ice cream. Now I’m sure y’all remember that 4 quarts is 1 gallon right? Go up just a bit in this paragraph and see how much ice cream I got for $4.00. 5 quarts. Without doing any more calculations you can see that I jipped myself out of a quart of ice cream. Not only that, I paid more for less ice cream! Now these were 2002 prices that I’m noting here so you know as I know, it’s gone up a whole lot more since. I bring this up to point out a practice that’s been going on for quite a while. 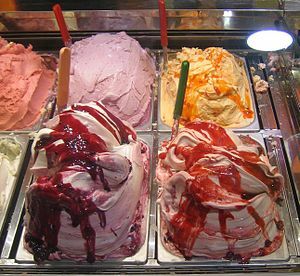 But you gotta admit, the ice cream in the photo looks really good! 🙂 OK…back on topic. I’m referring to how corporations are raising their prices and/or leaving the price the same but making not so readily noticeable changes in the amount of product. It boils down to what is still a price increase. They are counting on is you not paying attention. Think I’m kidding…here’s another one for ya. A pack of cookies, (it should be obvious by now that I love sweets lol) used to have 4 big cookies in it and cost $1.00. So that works out to be $.25 per cookie. Now, the company decides to change the packaging, tell you it’s space saving, bigger cookies or whatever jive talk that are spittin’ out and only put 2 cookies in there but leave the price the same at $1.00. Now each cookie costs $.50 each. That’s a 50% price increase!! In many cases using this same example, they’ve not only reduced the amount to 2 cookies, they’ve raised the price to $1.10. That’s an even bigger price increase. Many times it’s not quite as glaringly obvious as the last example but it’s there nonetheless. So folks, ya gotta start becoming conscious and paying attention to where ya money is going. I’ve focused on this first because it’s the fastest and most efficient way to get more money freed up to have to accelerate debt elimination. What I came to find out was that I got more motivated to look for more ways to slash my budget so I did not have to go out and get a second job. 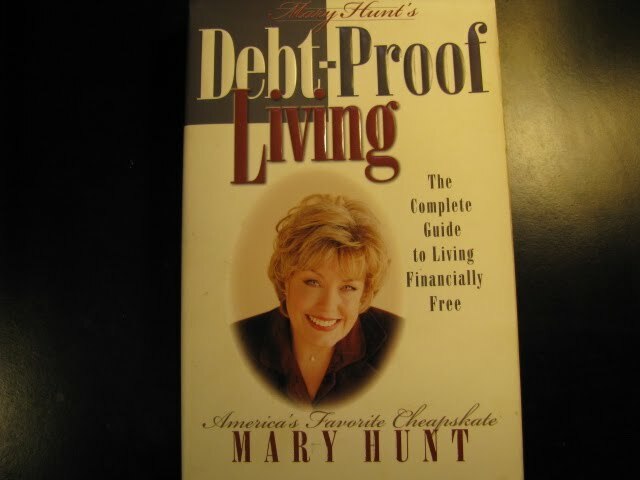 1)”Debt Proof Living” by Mary Hunt. She has a website of the same name as the book that is a paid subscription site which is quite reasonable at the time I had one. The non-subscription part of the site was nice. See if your local library has them first. Then if you like them, you can look for used copies or again, examine the details and see if buying them new will come out cheaper. With Amazon.com, if your purchase price is $25 or more you can get shipping free. I’ll talk more about these books and others later. Are you ready for more? I hope so! Then on to part 2. Disclaimer: All of the products mentioned in this post have been purchased by me or borrowed from the public library. I have no affiliation with the producer/manufacturer or distributor of the product nor am I being paid to review the product mentioned. The opinions set forth in this post are solely my personal opinion. Thanks to one of my YouTube subscribers for alerting me to this, so I thought I’d share. The video is of an interview done with Amy Dacyczyn known as the “Frugal Zealot” in the 80’s I think. She is the author of the “The Tightwad Gazette”. 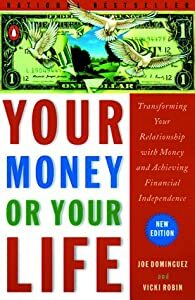 This is another book that I used as inspiration on my way to becoming debt-free. Some of her methods are a bit extreme but I feel that it is a springboard to be used to stimulate ideas of your own. Many times we just give up, thinking it does not make a difference when looking at the whole situation. But a journey is made manifest by taking one step at a time. That leads to the next step and another one comes after that and on and on. I totally agree with her when she says in this interview that frugality should not just be practiced when in recession but when times are good as well. It may not prevent the recession from occurring but I believe things would not be a hard as they are right now if this had been done. I’ve been asked by Kicukalah why I don’t use A/C and is it unhealthy? So I thought I’d address that in a post instead of in a comment. First off let me say that I don’t condemn anyone who uses A/C. That would be indicative of the saying “get the stone out of your own eye before teasing someone else about their stone”. Y’all, I used to have the A/C turned up in my house so high you could literally hang meat up in there and it would not go bad. Yeah, no joke. Getting to this point of not using A/C has been a long process taking place over several years. 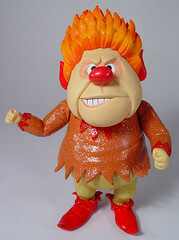 About 7 or so as I’m going into the 3rd summer of not using A/C. The initial reason and generally always the first consideration for most choices I make are monetary. Monetary in considering the on going costs vs the value I’m getting. The other is that I hate being dependent on something that I have to earn money for especially when you factor in the income taxes, gas taxes, sales taxes and all the other taxes that have to paid. That’s only the beginning. To have $200 you’ve got to earn $250(an estimate)so that you actually have $200. If anyone doubts that just take a look at the gross amount on your pay stub, then take a look at the net amount. Big difference huh?! Then you gotta to pay your bills and buy all the stuff you need so that you can get to work to earn that x amount of money you need to pay for whatever. ***stepping down of the soapbox**** When I began what was to originally in be a reduction in A/C use that led to no A/C use experiment was that in 2001 when I started getting serious about getting debt free, I began looking for every which way to Sunday, up and down all around in which I could save money to apply toward my debts. Here’s some background on how I got to no A/C use. This house is in an older neighborhood with many established trees. That helps greatly in reducing how hot the house gets. Also there are lots of windows for such a small house so I can take advantage of cross-ventilation when there is a breeze. After a while, I was finding while sitting down I was getting chilly with the A/C set on 78 degrees so I would turn it up to 79 or 80. Then gradually each summer I would turn the thermostat up till the summer where I was up to 86 degrees. There was a 1.5 year break when my mother was living with us. But when I got to that point I thought to myself, since you got the temp up this high lets try going without for a few days. Well that turned into 90% of the summer of 2007 which ended up being the hottest and driest summer on record for us and all of the summer of 2008. I’ve also found that my appetite has regulated itself back to where it was when I was younger, before having A/C. Back then in the summer my appetite would slow down because I’m just not as hungry when it’s hot. I’ve been able to maintain a 40 now 50lb weight loss and I know this is one of the contributing factors. And yes I’m in an area of the country where it’s hot and humid in the summer. I’m now much more adaptable to the heat. Being constantly under A/C makes your body much less tolerable of the heat. I only wish I would have done this when I bought the house. Would have saved myself thousands of dollars that I can really use right now. I hope that everything is OK where you live. Storms came through here, bringing with them high straight line winds early Monday morning so I’ve been without power for almost 2 days. It went out at 2:15 am and I just got power back about an hour ago around 4:45 pm. It’s reminded me how 1) Procrastination sometimes pays off, 2) Reducing/eliminating meat intake pays off in ways other than health and 3) how dependent we are on electricity. Yes, I procrastinate sometimes though I’m looking at it in a positive way or maybe trying to justify it. lol What I mean by looking at it in a positive way is that I being an Aries, have a tendency to be impatient, make snap decisions and charge forward without thinking. Basically leaping without looking first. This characteristic was very prominent when I was younger. Now that I’m more seasoned lol I think a bit more, sometimes too much. That’s my Virgo rising which has become much more pronounced in my persona. What does that have to do with stormy weather or anything for that matter you ask or for some of you other Sun/Rising signs not known for patience ahem, Cancer, Leo, Sagittarius, Scorpio, you’re probably saying get to the point already!?! lol OK, I was planning on going grocery shopping this past Friday and for one reason or another, probably laziness, I did not go. Since I did not go grocery I did not have extra stuff that had to be refrigerated and with this 38 hour power outage that could have been longer, I did not have to worry about loosing food that I just spent hard earned money on. That leads me to the second point of reducing/eliminating meat intake. I’ve significantly reduced the amount of meat that my husband and I eat over the last 3-5 years. Since we still like to eat out on occasion, I’ve decided to cook very little meat at home. We still eat salmon. That translates into having very little meat in the freezer that could have spoiled in this prolonged power outage. The goal is to get to 100% vegetarian in the next year or two. Lastly, we have become very dependent on electricity for day to day living. Now admittedly, I really enjoy the Internet as I’ve met some wonderful people in just the last year or so and missed not being able to go online for almost 2 days. However, I enjoyed the sounds of nature and things other than electronic noises. I went back to my first love of reading books. Some people were complaining about the loss of electricity but it got neighbors outside talking to each other. Though for the most part it was the neighbors that usually talk to one another anyway but still it got people… out of the house and into nature. Since hubby & I canceled satellite TV a couple of weeks ago and we do not use A/C, the power outage was just a minor inconvenience. That’s another way my procrastination paid off. I was looking into go with bare bones basic cable TV service since they were offering a package with the broadband I already have with them that was cheaper than what I was paying with satellite and broadband service. Well on my birthday, hubby surprised me by saying he was not going to watch network/cable TV anymore. What?! Who are you and what have you done with my husband? Y’all I love this man but this is the same man who complained the last time the satellite was out because the dish had gotten misaligned and they could not come out for 2 days to fix it?! Whew, I’m so glad I had not already called to change over to cable because having to cancel that soon after starting it I’m sure they would have charged me a cancellation fee. Well, that’s my 2 cents for the day. Ok I had this bottle of Aloe Vera Gel that I bought 2 years ago when I first went natural that was about to expire in July in this year. 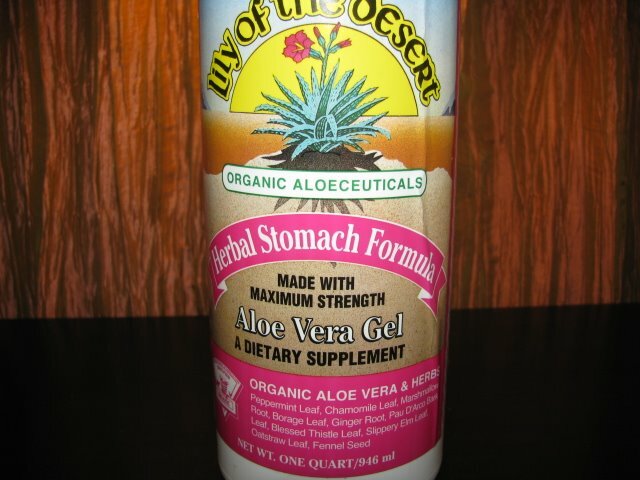 I was using this in the shealoe mixture consisting of shea butter, coconut oil and of course the aloe vera gel. Well now that I’m locking I did not want to risk using that mix in my locs though I still use it as a face and body moisturizer. Anyway, there was oh probably 1/4 left in the bottle that I did not want to go to waste and for those of you that have seen my You Tube videos know I don’t like to waste anything, especially hard earned dollars. So I thought I’d pour the rest of the aloe vera gel in my shampoo mixture since it was almost empty. I then added a bit more Dr. Bronner’s, peppermint & cedarwood essential oils. Wow, you talk about even softer locs after they’ve dried than before for me! Now part of that may also be because it has been raining here at least once a day for the past 3 weeks therefore the humidity in the air has been minimum 70%. But the sheen has been kicked up a notch, even the locs in the back that are doing their thing. I’ve also oiled my scalp only with coconut oil and a couple drops of cedarwood and peppermint EOs each. Motowngirl has info on a few essential oils so that’s where I got the idea to try the cedarwood and peppermint oils. On another website (click here) mentioned that peppermint oil was for dry hair & helps promote growth. As far as the peppermint I can understand growth but I would not have thought is was for dry hair. However it really does make sense in that the mint family of plants thrive in drier growing conditions. Dry conditions… dry hair, maybe there is a connection. The other reason for trying this combination of essential oils is that I’ve had issues with high blood pressure in the past, so I thought it might be a good idea to look for an alternative. So to clarify (no pun intended), I am no longer using rosemary or sage essential oils in my shampoo mix or spritz. Aloe Vera, I’ve found in my research is strengthening for the hair, soothing for the scalp, aids in hair growth and has amino acids. One lady on the LongHairForum says uses it as a strengthener since it has protein in it, using it like Aphogee I would assume. I’m gonna try it that way, since that will be a whole lot easier to deal with than henna. If you use the aromatherapy kind of essential oils that are for external use only, which is probably what you’re getting at the health food store and use them a lot check out this site the http://www.thecatalog.com. I ordered the EOs that I’m using at quite a bit of savings than if I purchased the same ones at the health food store. I was very pleased with how the order arrived. I got the big bottle of lavender, peppermint & eucalyptus oils and quite a few other oils since I like to make air fresheners out of these in addition to using them for my hair and future concoctions. Here’s an example of the savings. The lavender EO was $47.19 for a 16oz bottle with sales tax (which they did charge for my state by the way at 10 %) is $51.91 and with shipping (if you ordered less than $75.00), grand total $56.91. That means that each ounce, which is the size of the bottles that you purchase at the health food store or GNC is $ 3.56. I don’t know about y’all but where I live even at GNC, I paid $8.79 for that 1 oz bottle. Buy 16 of those and you’ve paid (sit down b4 you read any further ’cause you may have already done this) $140.64 sales tax included. Which is better $56.91 or $140.64 especially if you are purchasing/using the same product/thing whatever on a regular basis?! This is an illustration/reason to have liquid savings aside from your emergency savings to take advantage of things like this and how we unconsciously dribble away our money. But that’s a whole ‘nother post. I’ve been asked where I purchase my coconut oil from in bulk. That place is Tropical Traditions. 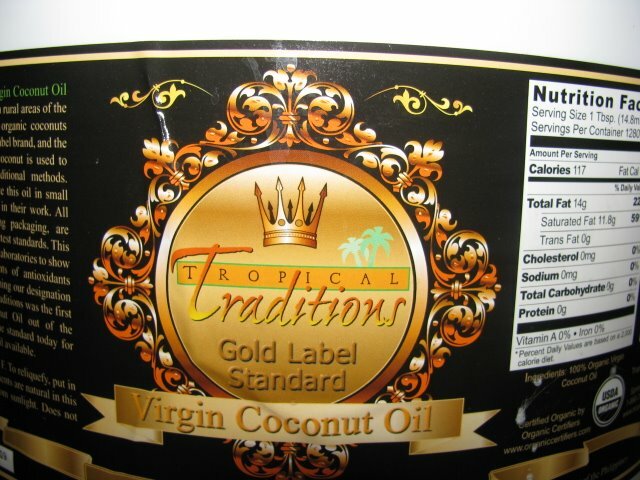 It is the gold label virgin coconut oil and for the 5 gallon bucket, it is a lot to shell out at one time. At $230 + shipping and to my area of the country that was $20 for a total of $250. I do use it for more than just my hair, as I mentioned in the previous post I cook with it, use it in my shealoe mix for my body (face included) and now I’m back to using it (the coconut oil alone) for my hair. I used to use the shealoe mix for my hair too when it was loose. Now, that works out to about $6.24 per 16oz which is the largest size I have seen offered in my neck of the woods. The cheapest I have run across is $9.99 at Walmart in the vitamin section which is virgin coconut oil to $19.99 at the health food store. Of course to get those savings, you do have to get the 5 gallon bucket. The savings gap is a lot less as the next size down from the 5 gallon is 1 gallon. The regular price for the 1 gallon bucket is $70+ shipping. That works out to a bit under $9.00 per 16 oz, since I’m sure shipping would be a bit less. Oh, I just went to the website and they have a special going on for 2-1 gallon pails for $99 until Sunday March 22,2008. That is equal to the per 16oz cost of the 5 gallon bucket. If you miss the sale, don’t worry they run sales quite often so I would not be surprised if you see that offer again very soon. At the regular price though, it is almost equal to the Walmart price but you don’t have the containers to throw out and clog the landfill every time you run out and purchase more, unless of course you are saving those containers to reuse. I reuse the one container I have when I was trying the virgin coconut oil for my shealoe mix. So, you can see you will save a significant amount by purchasing in bulk, especially if you are going to be using it a lot and there is no reason to end up paying more for the same product. Another more simplified example. The Walmart virgin coconut oil is as I said $9.99…$11.00 if you add tax, for the 16oz jar. To use 5 gallons you would have to buy 40 jars and no that is not a typo. At $11.00 a pop you will have spent $440. Which would you rather pay, besides free which is not an option here lol, $250 or $440? Y’all that’s my Virgo rising, gotta analyze. And you thought there was not going to be any astrology in here…not. But only a tiny bit, I’m not that proficient in it yet. Ok, back on topic. “5. Does Coconut Oil need to be kept in the refrigerator, and how long does it last?